Please note that we use the service Eventbrite to sell tickets which is located outside Canada. If you do not wish to use this service, you may come to the Administration Office of St. John’s College, 2111 Lower Mall, and pay for your ticket in person during office hours: Monday – Friday, 9 am to 4 pm. We know that many of us here at UBC recognize the challenge in creating meaningful conversations and connections between staff from different units, and that our own personal networks play a key role in sustaining and supporting us in our UBC roles.What if we could share those networks with each other in a way that could foster better linkages and community among colleagues from across the institution, and across bargaining units and staff associations as well? If we could create innovative ways to build relationships, and nurture those networks, could we foster a more inclusive and productive working environment at UBC? Our thought: absolutely yes, and so “Hot Lunch” was born. Let’s meet over lunch with a group of our colleagues from across the University, and share thoughts and conversations about how we might work toward the goal of establishing richer and more meaningful networks across the institution. 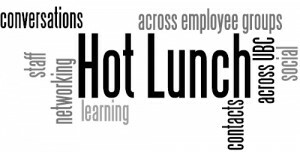 Hot Lunch is a cross-campus staff networking initiative hosted by St. John’s College and co-sponsored by the office of each of the Vice-Presidents with the special support of Human Resources. The 2018/19 Hot Lunch season kicks off on September 25 with Prof. Santa Ono! Hot Lunch February 2108 group selfie! Is it OK that I can only attend part of the session? 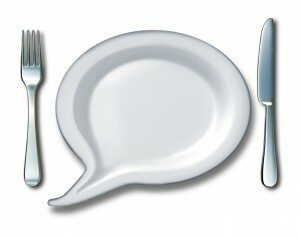 Yes, come for as long you are able or when your lunch starts, and feel free to leave when you need to. How many Hot Lunch sessions can I attend? What is included in each $10 session? A hot lunch that includes a full buffet (includes vegetarian options), speaker, and the opportunity network with colleagues you may not otherwise meet in person.